Sometimes we just don't have the props, or in this case some random wildlife hanging around the studio. 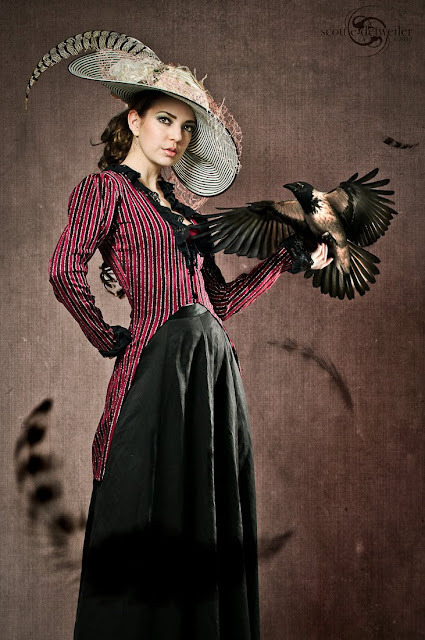 Upon seeing this hat that Valarie brought to the shoot, I immediately envisioned her standing in an area with some crows. Don't ask me why, cause I don't know myself. Often something little will set off an idea, and you just have to roll with it and not fight it. It isn't really something you can be taught, you just have to learn to let you mind wander as you stare at the model or a prop and accept without question what might appear and start exploring it. I have often warned models that I tend to sit there and stare into space for a while and they are all used to it by now. I also like to write down ideas and then choose from those or combine them. In this case, the idea hit me right in the face and there was no second thoughts on it. Because the hat has tipped me off, I know the bird(s) will need a landing place, so the tips of the fingers would work. I thought that a single finger might be harder to work with depending on the bird (which we don't exactly have handy), so I decided on "tips-up" type of gesture which will probably be the most flexible. The model here is an incredible professional and needed nothing more than to hear my plan and she completely understood. Val has to be one of the best models I have worked with so far in my career. 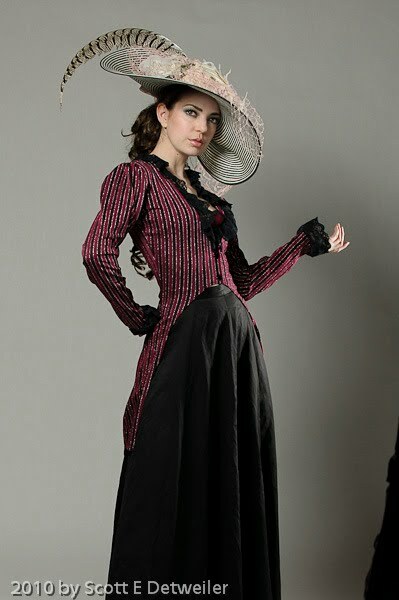 She also carries a bevy of props with her, and this $1,400 hat was amongst her menagerie of garments. There are 4 lights in this shot, or that was the plan anyway. To add a little variety and to bend some rules I used a 22" beauty dish with a cloth "sock" over the front of the bowl. It was camera right and pretty high up as well as far back (6' or so), from the model. I ganked up the power, so it would reach her at ƒ5.6 or so. Because the source is smallish and further away I expect the shadows to be a bit more sharp, and indeed they are. There is a strip-light on either side and slightly behind her, but as you can see the strobe on the left didn't fire. Oh well, I think it worked out as it is anyway. 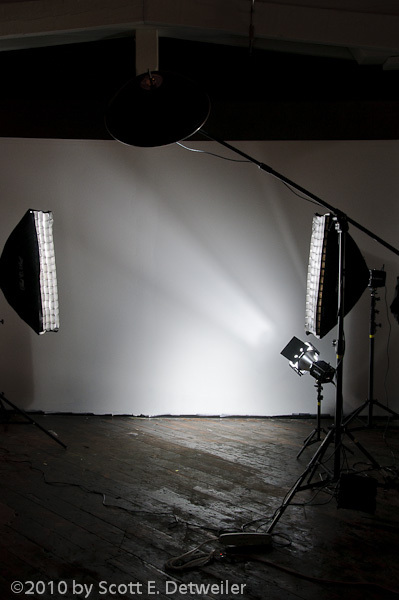 The other light is a large softbox that is on-axis with the camera (you can see it in the original photo) and set 2 stops under the key. This is to help fill some of the deeper shadows that I am creating with the smaller key as well as light the background a bit more. In CS5 there is a new "Add Bird" command under the images menu. From there I selected Crow from the checkboxes and then hit apply to position the bird on her hand! Ok, well this was actually a bit of work, but not impossible by any stretch if you have a clear vision in mind. The first thing I needed to do was to find the tone for the image. I used a texture I like, desaturate it so it does not contaminate what colors I have, and added a color adjustment layer to move it a bit toward burgundy. I also had to mask out the model from the background, which I tend to do on about every work. If you can make "planes" of foreground and background elements you discover a lot of capability you will have over working on the image as a whole. I then took a Dodge brush (large and soft), and added a bit of randomness to the background texture with a 9% opacity on the brush and proceeded to paint like an idiot randomly. I wanted a mottled look here, so I needed to handle that to avoid it looking to flat for my taste. While my right hand was painting, my left hand was looking for stock images of birds to use here. I don't happen to have any cool crow photos laying about, so I bought one from iStock for an embarrassing amount. I still think iStock hurts the photography industry, but then again times change and there is no going back to the days of $4,000 photos, but that is a topic for another day. I also found some feathers and this nifty bird and placed them into the image. The feathers were sliced up from a larger image and placed using the multiply blending mode into the photo. Mind your depth of field here, as the front feather would not be in focus given the ƒ5.6 and focal distance. So, I used lens blur on that puppy and then doubled the layer because closer objects have more contrast than those in the distance and these feathers are pretty light using this mode. The other feathers are similar in process but might have less opacity for the previously mentioned reason. The so-big-you-could-eat-it crow was next, and it was going to be fun (well, fun to me anyway). First we create a curve adjustment layer and mess with each color until it seems to fit the scene. In this case I was using her skin tone as a goal for the breast area of the bird. I used the dodge and burn tools to "re-light" the bird so it matched the lighting configuration. I also added some tonal changes to help it appear more realistic than it did in the stock photo which I bought for a wee pittance. I moved the bird into position over her hand and painted in the claws as I felt they should be using a round damn-small brush (almost a pencil). Remember to borrow tones from the rest of the bird to make it appear real. I then revisited my dodge and burn layers with fresh eyes after flipping the canvas vertically. Remember to do this every so often so you can see things you missed the first time. As the feather of the bird pass in front of her bodice, I added the shadows there to help it become a more solid object in the reality we have created here. Shadows are the key and you have to pay great attention to them. I might cover the types of shadows at some point (yes, there is more than one type) so everyone knows where to start and how to build them up. Final step was to add a photo filter adjustment layer (some seemingly random flavor of blue) to cool it down just a bit and rescue any value error I might have created with my meaty-fisted tone curve on the fowl in question. After staring at it for a bit I also added an overlay layer and used a white brush to bring her "forward" from the background (thanks to my earlier creation of her mask). Total time to complete is about an hour, sans potty breaks from the green tea binge I was on at the time. Questions?